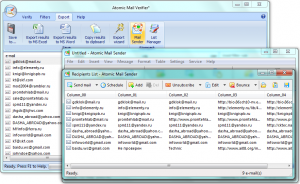 Atomic Email Studio Reviews Recently Reviewed! Using product since 2008, I never faced problems. Instant help from customer/technical support team. 1) It's very easy to use and thus doesn't require too much of complex learning. 2) Help section is well designed and well written for non-technical people. 3) Language used in the help section of software is easy to understand. 4) Software execution takes place at a super fast speed. Cons: I want to help the company to add one more feature to their software and that's the proxy switching feature. If there is a proxy switching feature similar to http://www.proxyswitcher.com/ then it will help the users of this software to extract and send emails even when the user's IP address has been blocked. This feature if implemented in email extractor and email sender; will definitely benefit the user a lot. This will make your company's software most unique product in the world. Overall: I can find the contacts of any person across the world using this software. I can send marketing/promotional mails to mass population across the nation and also across the world. I can use it easily without getting into the depth of complex technical issues. I also do NOT need to learn complicated technical terms to operate this software. I also never required to teach my team about the installation, implementation or usage of the software. It's very easy for them to do it themselves. There are numerous other benefits that I get from this software. However, at this moment I don't remember all of them simultaneously. Pros: First, I would like to say this is the most versatile email marketing tool I have ever come across. The biggest challenge in email marketing campaign is getting reliable email addresses. This tool does the unimaginable in helping to extract email addresses from multiple sources - your hard drive, email accounts such as yahoo, gmail etc, websites, social media networks such as facebook and twitter. Anyone serious with marketing his or her brand electronically will find this tool indispensable. It has all the perfect modules to assist you to succeed - extracting email addresses, sending bulk emails, verifying email addresses etc, nine modules in contained in the studio. It couldn't have been better. You do not need to pay anyone to launch electronic marketing of your products or services. The price of the software is unbelievably affordable. Most agency charge monthly fees for email marketing. But with this awesome tool, the burden of monthly fee is removed forever. Cons: You can only use one module at a time with the Atomic Email Studio. Overall: My experience has been extraordinarily fulfilling. I had struggled with how I could implement a strategic Email Marketing Campaign for my company. Just when I was to pay a large fee to a marketing agency, I stumbled onto this marvelous software that provided me with unspeakable solution to my challenges. I now do my email marketing without the support of any third party company. I run my campaigns with utmost ease it felt too good to be true but it is true. The tool does everything seamlessly to save your energy for other activities. Pros: it's simplicity and API for most common languages. even your tutorials are awesome. we didn't spent a lot of time to use the API since the tutorial is read to go. Cons: for third world country the price is still expensive. plus even the message is delivered to users but i see as waiting (0%) delivered. Great software and awesom support! Pros: Ease of use and working like a charm! The software is well designed and working . Nice templates included. Cons: The only thing I coukd think about that was missing was that e-mail sender could remember last location of imported e-mail file. Overall: It helped us growing oure bussines. Cons: There is no issues with software, though would like to see possibility to run multiple campaigns at same time. Overall: Amazing software and support! In the beginning it was pretty difficult to use the software as I was a total newbie in email marketing. Every part of the software does it's job step-by-step. Everything was explained and fixed, so I am pretty happy about this experience. Cons: some small issues with explanations - but quickly resolved with the "Chat' line. Software could use a little work. I've had a bit of trouble, but support was very helpful. Pros: The price is great, and very comparable to others in the market. I love that the technical support is 24/7 because I've had quite a few questions, and answered each of them promptly and precisely. Cons: It's a bit difficult to use. I had some trouble uploading my contacts and getting them in the correct format, as I'm in the US. Also had a little difficulty implementing the recipients names in the sms text. I wasn't too enthused to find out that I can't send the message from a specific Sender ID because of the county I live in, but I already put additional money on the account so I will definitely make due with what I can. Pros: Usability and User Interface is very simple. Cons: I have nothing as such.. Just try to include unsubscribe link from your end. Pros: The interface is simple and easy to use. Its fast and the multi-functions that comes with it makes it so nice to customize settings to suit individual needs. I also appreciate the constant update that comes often + plus the customer support is amazing. They also keep logs of your registration key for years so if you forget or lose it, just login to AtomPark website and there you will find your order records with your key. So far, I recommend this 99.9%. Cons: Compared to others, I do not see any complaint. Just to be fair, I will say the price, but since I use other Atom Park products, I get discount codes and so cost is no problem for me. so I recommend, when buying, just add more products and you will get discounts. Pros: I've been working on customer support dealing with clients and all I can say is that this job was one of my best jobs ever. Clients were very happy buying AtomPark products and it was always a pleasure to talk to them. They had only minor problems which I could resolve in no time. If I will have the opportunity again, it would be my pleasure to work with them again. Overall: I have been able to grow business sales. Cons: None, I cannot find anything to suggest needs improvement, works great. Its really easy to learn how to use, and the customer service people will help with any questions, in my case i had loads. Pros: It does what it says. It's cost effective software. It's like one time investment for any business that do marketing via email. Cons: Although it's cost effective but does not guarantee 100% accurate results. And I am writing this review not to win any contest but to actually make aware other people about it's reality. No doubt it's one of the best amongst its class but still there are some limitations. You need static IP, port 25 must be open, your ISP should not block it, Yahoo mails does not verify if they exceed 50 numbers per day. Similar with Hotmail mails. Gmail mails verifies without any limit. It may also possible that this depends country to country. It is nice but you can not preview merge fields even in preview tab, then what's the use of it? Further software built in templates and formatting options are kind of 90's ... No comparison of mail chimp to any other service provider. Overall: It's complete package for email marketing for small to mid size business. Even large businesses can also use it. Cons: Buggy as hell. Can't import any file more than the emails (say other contact info associated with that email, such as a name)---->I really, really you all would change this up. This is easy to use, and is normally reliable. Pros: I find it easy to create and send out merged emails. Customer support is outstanding - second to none. Overall: It really does make life easier, being able to send multiple bespoke emails to my clients. Pros: There are two different program type, one is making your business easier and other is difficult. Email hunter is one of the making thinks easier, espacialy for email marketing. Actualy all atomic programs making thinks easier. This type of programs necessery in our time and atom family made it. Overall: I get rid of prepare all the mail adresses by myself. 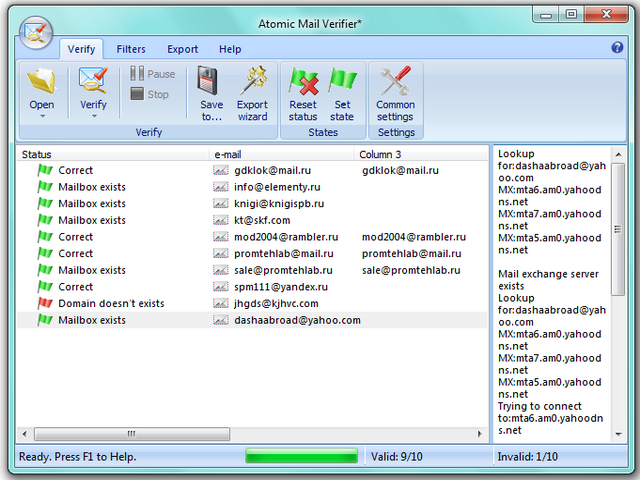 Mail Verifier and senders are most needed program for me. I need to use both of them. It worket to me improve my marketing ability. Good advantage. Pros: I love the software, I used different tools for my outreach and email marketing initiatives but and I always ended up with a whole mess going from one tool to another one. It saves a lot of time to handle everything with one solution that covers it all. Cons: I would like to see more video tutorials in the site with actionable marketing tips. Overall: I like everything about the software and the software always do the task instantly. especially the email verifier software is very very amazing to me. I started with the trial version and it was very very great that's what impress me to go for it after that i found out that all is very nice. Cons: One needs to be very careful to use the correct settings to ensure that spam emails are not harvested. Most impressive marketing software I've seen! Pros: I like that it covers every aspect of selling online that I--or anyone--need to succeed. I can FIND my customers, ANALYZE their needs, make the sale and KEEP THEM INFORMED. Cons: While I KNOW that AtomPark has to make money to stay in business, I don't like having to pay ... not just for their products, for anything! Overall: I'm VERY impressed with AtomPark's entire software line. They cover EVERYTHING! With their products, you have to succeed at whatever you're doing online! Check it out yourself! Pros: I love the ease of setting up this software and the tutorials on how to use it. Our team absolutely love it and we have increased our marketing as a direct consequence of having bought and used this software. Also being able to have the whole suite of software is a great bonus to have on hand. Pros: I like the ease with which it fetches the data. The various options makes it more interactive and time saving otherwise the work would take a long time. Cons: Sometimes a message pops up saying to put a keyword to search. Little irritating but its a minor thing. Overall: It was a wonderful experience. My work has become easier and I have saved a lot of valuable time. Cons: User Interface can be improved. Even now its fine, just a little more always helps. Overall: I have been checking out the products of Atom park and rep has been assisting me since the start. I finally bought the product Email sender and I faced a small sending error due to my lack of technical knowledge and rep helped me very quickly and solved the issue for me. rep and Atom Park - Thumbs Up! Recommendations to other buyers: I need SMTP help personally and I have a future project which needs to be marketed and I will buy one more Email Sender. Pros: I like the fact the that the software is simple and has a very nice user interface. My clients find it very easy to use and i really love that. Cons: Cost. However compared to other online email extractor and verifying services.. this beats them by far. Overall: Does what it says it will do. Pros: The software scrapes many websites and goes very deep to extract many emails. The best software out there, check it out! Cons: No cons. I have not found anything wrong so far. Overall: Easy to use and get started fast. Cons: no there is nothing that i dont like, plus they automatically fix there systems bugs. and the one more thing that i like is that, they have best software's at very less price. Pros: It has great function that others don't. Cons: Friendly user interface, great works to do. Pros: Atomic Email Studio is an all-in-one email marketing solution that consists of 9 top email marketing programs. 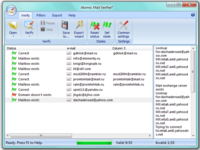 Amazing software almost all that you need for bulk mailing in unbelievable price ! 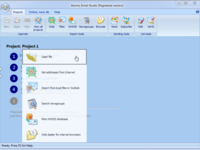 Pros: All tools in Atomic Email Studio are Great and easy to use. 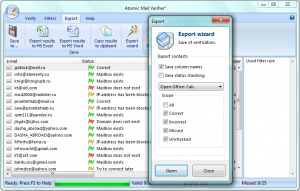 Overall: I have used Atomic Email Studio for email verification , Mailing list filtration and Ordering and about to start using it in Bulk mailing, Honestly it amazes me how Good it is and when I compare with other emailing software Atomic always wins. in Addition to this the support team is great !! Recommendations to other buyers: I hope you provide SMTP service in the future . Overall: I did not know how to use it but tech support explained everything to me. The hardest part was Verifier. We have port 25 blocked here, so we had hardtime setting the software through the remote server (instead of hosting) but again - support guys are best! Pros: This is what you need if you have to be successful n your online business. This is an EMail Marketing Powerhouse and you are missing something big if you do not have it yet. Cons: I did not face any issues using this and I would easily recommend it. Pros: It's very easy to use and I like the features that it has. I'd recommend this to anyone who's looking for growth. Cons: I find that some features are missing like recording what urls you have scraped so you can see what's been done. Pros: They are always staying on top of changes. I have been using them for several years now and have been impressed with how they have adapted to the market. I would encourage anyone interested, to do business with them. They won't disappoint. Overall: great support team! I've used other packages such as Maxbulk (which crashes every 1500 emails and whose email verifier is a sad joke). This one is awesome. Pros: Quite a fantastic software, the customer support is also very professional and ready to help when in need. I have tested couple of their software and they have good quality and infrastructure. Cons: It too early to comment on that. so I might update that in the future.It too early to comment on that. so I might update that in the future.It too early to comment on that. so I might update that in the future.It too early to comment on that. so I might update that in the future.It too early to comment on that. so I might update that in the future.It too early to comment on that. so I might update that in the future.It too early to comment on that. so I might update that in the future.It too early to comment on that. so I might update that in the future.It too early to comment on that. so I might update that in the future.It too early to comment on that. so I might update that in the future. New and just finding my feet! 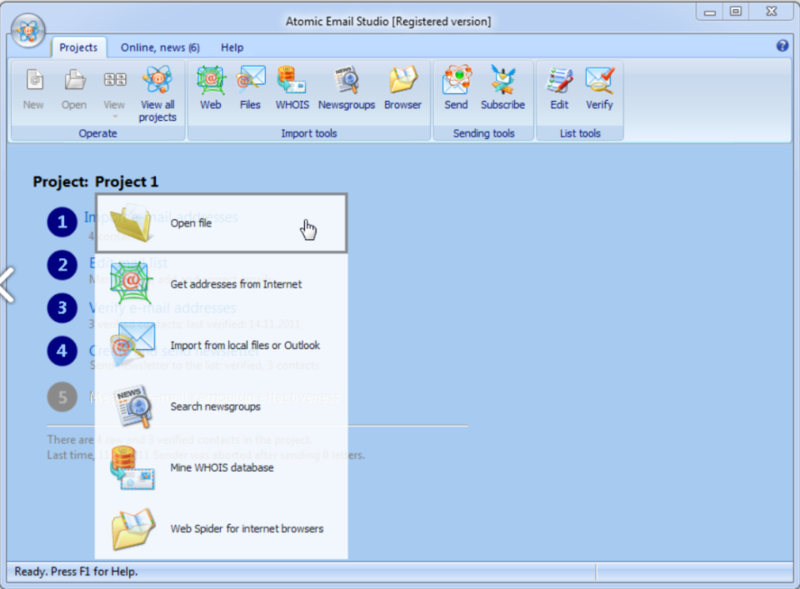 Pros: The functionality and ease of use of Atomic Email Studio is amazing. The fact that you can add functionality in units is a real bonus. Cons: Some elements are not obvious and some initial guidance is required. More Youtube instructional videos would be good as Users need clearer step-by-step up-to-date instruction. 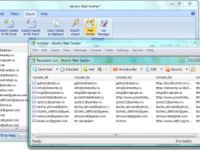 Overall: I tried MailChimp and others before I came across Atomic Email Studio and found that it was the best and easiest product to use in order to run an email database. I've already recommended it to others, even though I'm a relatively new user. Pros: it has complete marketing solutions. from scraping to sending. Overall: great, this was a life saver. Comments: I had occasion to use the support desk ( Because I am a beginner at this stuff ) and was very pleasantly assisted by Mariia. She answered a question that I was certain she would not know and I expected her to tell me to go and study the tutorials again. BUT she took the time to do a quick recap for me and it helped immediately. Im sure this was not isolated help from them/her. Have a great time with software, Its very powerful. Pros: need emails for marketing? Atomic Email has you covered. Cons: hard to learn. not really intuitive. Overall: I've been using Atomic for a long time. I love how easy it is to use and the fact that you can reach so many people while you are drinking coffee. Recommendations to other buyers: The best that I know of. Comments: My friend showed me this great product and I decided to get it. THe software really has everything, you can collect emails, verify them, sort them into lists and send out emails. Everything works fine especially if you send emails with your own hosting provider, as free servers sometimes block emails. I like that company works 24/7 and I always can reach them via livechat. Cons: It is expansive, when we need to change the installation we lost the serial.